This is a screenshot of a website. The website in this picture is wikipedia.org. A website is a set of webpages that are joined together. People look at websites with a computer of some kind, sometimes including the computer inside mobile telephones and televisions. The websites are kept on computers called web servers. There is almost always a single homepage which has links to other pages that are part of that "site". Sometimes it has links to pages that are part of other "sites" as well. (Note that net jargon uses the word site, which also means a physical place in the real world, to mean a web URL). A home page serves as the introduction page of a website. Websites can be used to advertise or sell things. They can also be used to talk to other people. A blog is a website where the location of the material is less relevant than who writes it, and which is more focused on dialogue. Very often the people who use blogs dislike the word "site" since it implies a controlled place. Sites are good for looking up information on the computer. Weblog (or also known as blog). 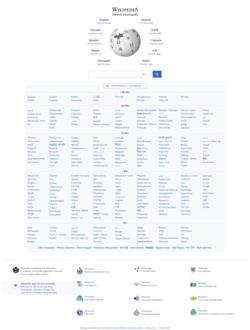 Wiki (A website where anyone can edit the pages). Content Management System (Software that can edit web pages through a WYSIWYG editor). Search engine (A website like Google, which you can use to search the web). Social networking sites (Like Facebook, which allows you to interact with friends). Web sites are usually shown in HTML (Hyper Text Markup Language) but are not always written or kept that way - some use WAP and others use XML. Website builder software is usually a collection of software tools that allow the construction of websites without manual code editing. Several hosted website services have website builder software built-in. ↑ "Weblog". Computer Hope. Retrieved 3 April 2016. ↑ "7 things you should know about... Wikis" (PDF). EDUCAUSE. Retrieved 3 April 2016. ↑ "What is a search engine?". BBC. 6 June 2013. Retrieved 3 April 2016. ↑ "social networking". The Free Dictionary. Farlex. Retrieved 3 April 2016. The Simple English Wiktionary has a definition for: web site.